Your objective is to predict the outcome of a bowling throw. First, place your bets by clicking the + and - buttons on the corresponding bet field. 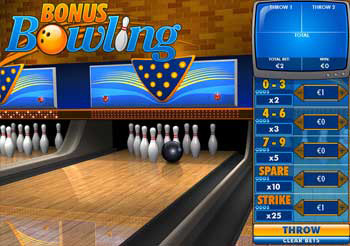 You can bet on the number of pins knocked down, on Strike (when all ten pins are downed with the first ball) or Spare (when all ten pins are downed with two balls). You can place several bets at once. When done placing your bets, click Throw. Two balls are now thrown (except in case of a strike, when the second ball is not thrown), and bets are settled. Click Throw again to place the same bets again. Clicking Clear Bets will remove all previously placed bets. Golden Frame is a special game round. If a strike is thrown during a Golden Frame, you win an amount that is 10x your total bet for this round. When a Golden Frame occurs, the frame result screen on the top right of the game area changes to a special image with the words "Golden Frame" on it.